Residents and visitors to Colorado love participating in their favorite winter activities. Skiing, snowboarding, snowshoeing, and snowmobiling in the backcountry occupy our snowy months in Colorado’s high country. Weather and climate determine snow conditions and inform safe travel. When it comes to safety in the backcountry, learning to interpret the weather and snowpack are the most essential skills a traveler can have. In this interactive event, join Walking Mountains Science Center with special guest Dr. Jon Kedrowski on Wednesday, December 5th at 6:30 pm as he discusses the details of our complicated mountain weather. Bring a note pad and pencil to record tips and information on how to not only plan and prepare a trip into the backcountry but to interpret, diagnose, and better understand Colorado’s challenging winter weather. Several case studies from Dr. Kedrowski’s projects and books on the Colorado Fourteeners and Thirteeners (both from skiing and hiking) will also be used to discuss valuable lessons in weather to help make important decisions in the field. Rocky Mountains snowpack and avalanche safety will be discussed as they relate heavily to weather conditions as well. During the conclusion of the presentation, Jon will also share his latest experience climbing Mount Everest without the use of supplemental oxygen, with discussions of strategy, risk management and weather considerations for the highest mountain in the world. 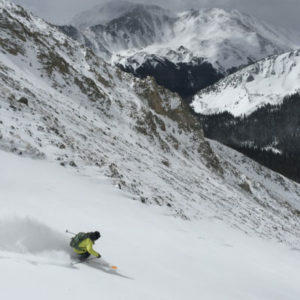 Dr. Jon Kedrowski, the author of Classic Colorado Ski Descents as well as Sleeping on the Summits: Colorado Fourteener High Bivys grew up in Vail, Colorado. He is a ski-mountaineer and an adjunct professor of Mountain Geography, Weather and Climate at Colorado Mountain College. In addition to over 1000 ascents of the Colorado 14ers and 13ers in all seasons (including ski descents of each of Colorado’s 14ers), and the 74 named 14ers in the continental-U.S., he has climbed six of the seven continental summits including Mount Everest in 2012, 2015, and 2018. His expeditions to Everest in recent years have been featured on Discovery Channel, Smithsonian, NBC, Dateline NBC, CBS, ABC, Fox, and CNN. Space is limited, please visit www.walkingmountains.org/sb to register!